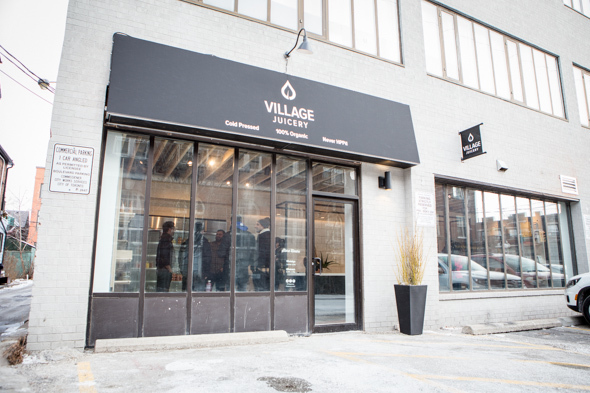 Village Juicery is the latest spot to cater to juice-thirsty Torontonians. Open in a sliver of a former medical centre just off College on Euclid, the shop is riding a recent wave of enthusiasm for cold-pressed, raw, organic elixirs meant to boost energy and health, but the two best friends behind the shop are striving to set their shop apart through secret ingredients, special production processes, and a clear, heavy focus on nutrition. "A year ago, somebody really close to me got into juice. It was very clear how much of a positive impact it had on their life," says cofounder Omar Shaheen. "Then they came here to start looking for it, just a year ago, and it wasn't really available." 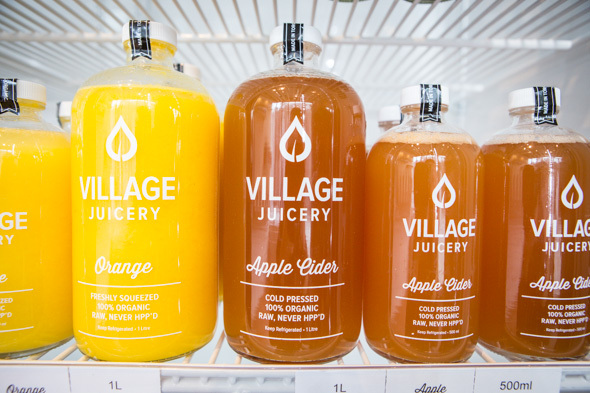 Shaheen brought the idea to his longtime friend Tyler Colford, and the two of them left "the big corporate life" to launch their own juice bar. 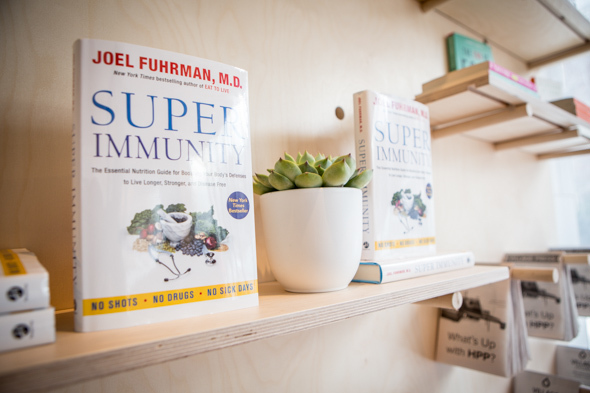 The duo threw themselves into research, partnering with local nutritionists, studying the nutritional benefits of various ingredients, and perfecting their own blends. 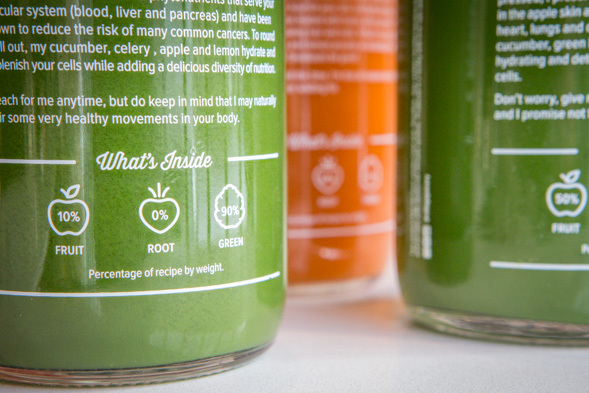 In their quest for optimal nutritional benefits, they experimented with ingredients rarely found in juicing, including red cabbage, sweet potato, turmeric root (whole, not powdered) and dandelion greens. "We go out of our way to find these vegetables that are super nutritious, super good for you, but are kind of difficult to fit into your day to day diet in a raw way." 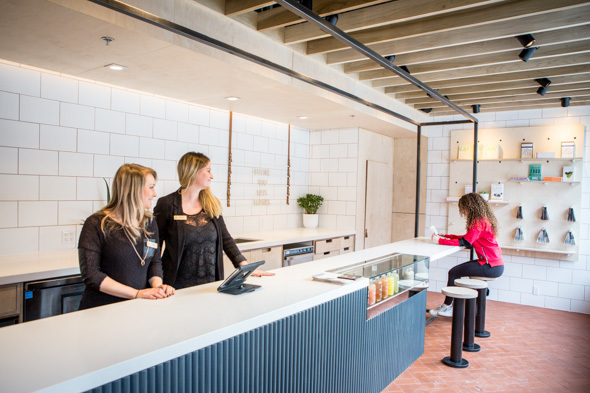 The sparse, airily-designed store is staffed not by baristas, but by holistic nutritionists, who are always on hand to discuss the nutritional benefits of various ingredients. 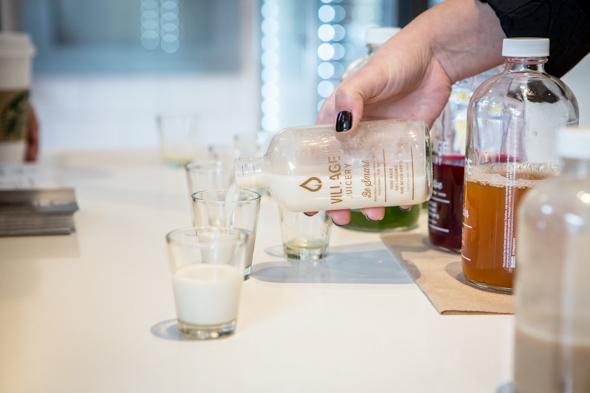 Nutritionist Jessica Lancaster walks me through a few of their blends ($10.50 to $13 for 500mL), starting off with a duo green juices. The aforementioned red cabbage is the centrepiece of the "Be Strong" blend. Shaheed says he was shocked to find out how healthy red cabbage was, especially considering how it's rarely consumed raw. "We were kind of adamant from the start to create a juice that had red cabbage in it. This was a labour of love," he says. Blended with lemon, beets, Swiss chard and apple, the cabbage still takes centre stage - it's a little disconcerting at first sip, but it grows on you. A little less in-your-face are my two faves: the "Be Radiant", which owes its bright-orange colour to sweet potatoes (with the starch strained out) and its zip to fresh turmeric root, and "Be Active", a beet-based mix with ginger, apple, lemon and pear. There's also some delicious nut milks ($9 for 250mL), including the serotonin-boosting "Be Happy" with cacao and medjool dates, as well as straight-up apple cider, orange juice and grapefruit juice ($5/250mL, $7/500mL, and $10/1L). 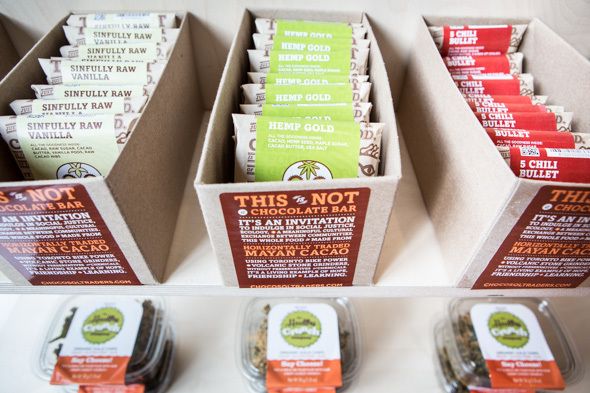 If you're looking for something to chew on, the shop also offers a selection of health-conscious snacks by local producers, including Nud Fud , Healthy Crunch (who make some surprisingly tasty vegan nacho-flavoured kale chips) and Chocosol . Whether or not you're into juicing for the health reasons, one thing's for sure: your tastebuds will go home happy either way.